Post Navratre we were longing to satiate our craving for the quintessential Punjabi food – complete with dal makhani, butter naan along with some traditional thick gravy chicken & mutton dishes. 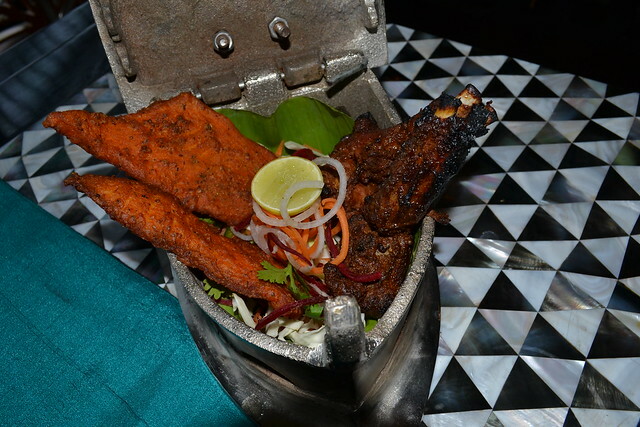 So imagine our happiness when were invited by Raddisson Blu, Kaushambi for a review of their newly launched “Punjabi Food Festival” at their restaurant – Kama – an elite fine dine Indian restaurant. 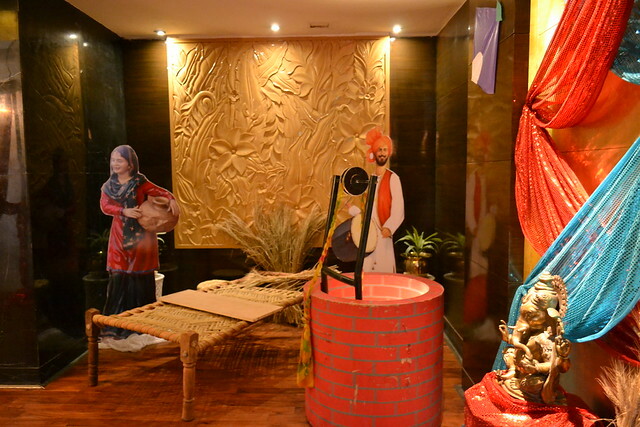 The decor of the restaurant was complete with kites, streamers & straw, along with a make-shift well and a charpoy, and few life-size cut-outs of people dressed in their traditional attire to reflect the typical Punjabi village. The view of their beautiful garden from the glass doors was serene and gives the restaurant a very airy feeling. Once seated, the chef welcomed us and introduced us with the ongoing festival, that it was an ode to the rich culture of Punjab. The menu looked well thought of, and consisted of 2 beverages, 6 starters & 6 main course items, both consisting of 3 vegetarian & 3 non-vegetarian dishes, and in the dessert section again 3 dishes. Dhuendaar Mattha: The best butter milk I’ve ever had, beyond doubt. It had such a distinct smell of burnt clove that I fell in love with it at the first sip. It was served to us in a small glass, so I sheepishly requested for few more :). You need to have it to realize how good it was. 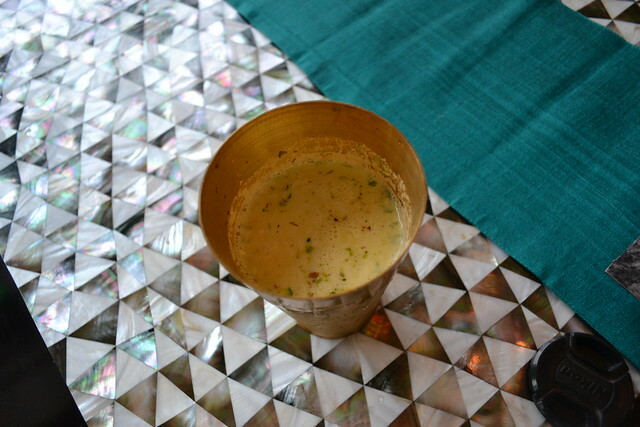 Badami Thandai: Again a brilliant beverage – milk blended with their home made thandai mixture with generous amounts of almond shavings and served in a big copper glass – too good! Soonde Aloo/Paneer Amritsari/Bhuttiyan De Kebab: Vegetarian starters are never my priority; however looking at their brilliant presentation of the starters I was tempted to try some of it. Soonde Aloo was fennel flavored baby potatoes, cocked in clay oven – very flavorful. Paneer Amritsari is another version of paneer ke pakode – a crispy coating, with very soft and fresh paneer inside. 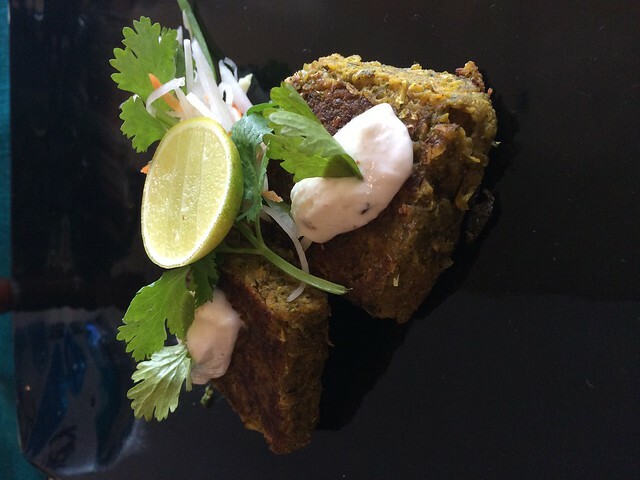 Bhuttiyan De Kebab was the best vegetarian starter for me – kebabs were made out crushed corn kernels along with cheddar cheese, shallow fried and topped with dollop of white dip. Chingaari Chaap/Khasta Kukkad Tangri/Amritsari Macchi: Kudos to the chef on the brilliant presentation – it simply a treat to the eye. 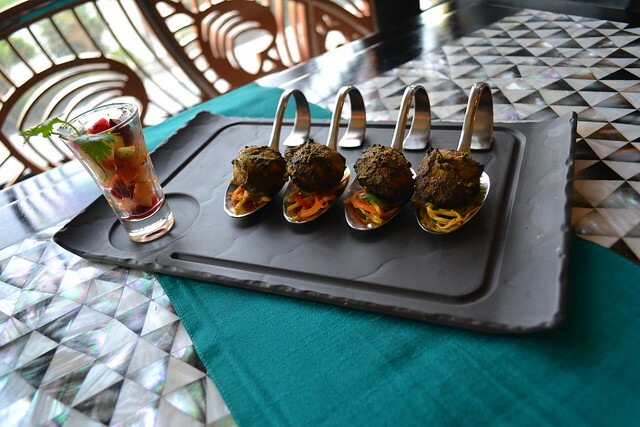 Khasta Kukkad Tangri had a marvelous presentation served on a vertical skewer with smoke from coal below it. Its juices intact and the marination perfect – eat this juicy chicken as soon as it is served. 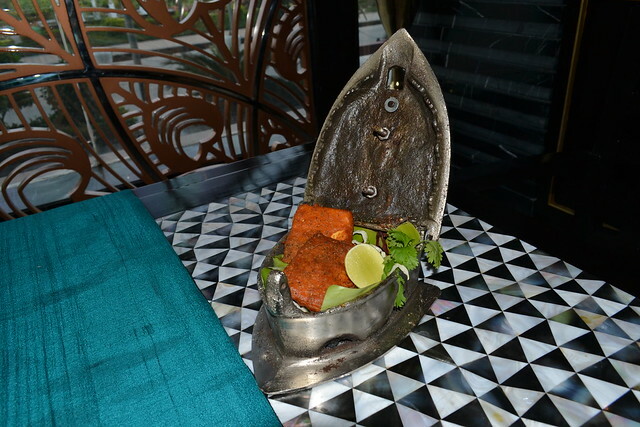 Amritsari Macchi & Chingaari Chaap was served inside what resembled a traditional coal based mini iron – very innovative. The fish was flawless – juicy and succulent, they use sol fish in their preparation. Chingaari Chaap was great too – the flavors used in the marination went well and the chaap itself was cooked well – moist & juicy. Paneer Butter Masala/Sarson da Saag/Langar Wali Daal: Langar wali dal was another gem coming from their kitchen – spot on flavours, and not your typical dal makhani, it was a mixture of many pulses and can fondly remind you of the daal you get at Gurudwara langar. Sarson da Saag, paired with makke di roti is always great – add white butter to it and you’ll be smiling all day long. Paneer Butter Masala was too good and reminded me of the one I had in Amritsar. Non-vegetarians don’t make the mistake of ignoring this dish, for it was that good. Dhaba Murg/Gosht Beliram/Tawa Macchi: Dhaba Murg & Gosht Beliram were the stand-out dishes for me. 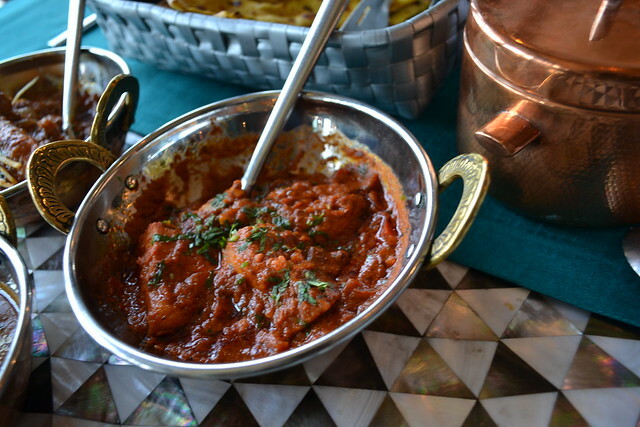 Dhaba murg had the raw textures and the desi tadka – with chunks of onion and tomato – very rustic and can easily compete with the famous dhaba chicken you get on the dhabas of NH-1. 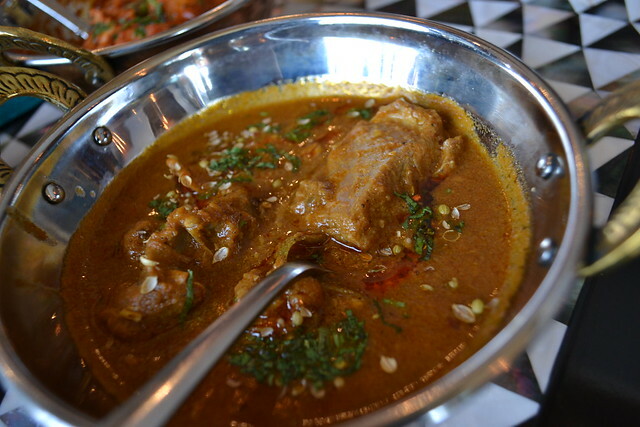 Tender meat pieces in silky, creamy and flavorful gravy – Gosht Beliram was delightful. Don’t miss this dish! Tawa Macchi was good too, and deserves an honorable mention. Both the rice dishes – Vadiyanwala chawal & Kukkad Pulao were great and had fried onion in them which added a very nice fragrance and went well with daal or chicken gravy. 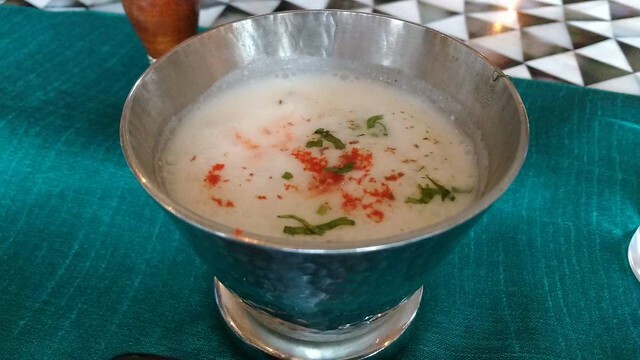 The desserts were spot on with Punjabi Aam Khand being the best of the lot – milk and mango cooked together – the chef told that with the onset of May/June, its taste will improve as better quality mangoes (read dussehri) will be available. 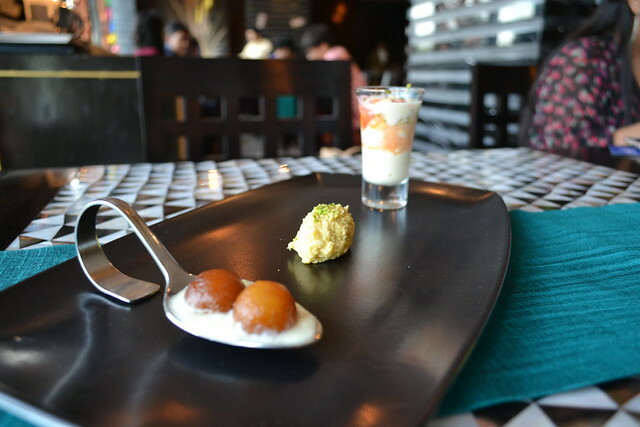 The name Jok-e-Shahi was new for me, and was glad to see mini gulab-jamuns served on top of rabri. The Malai Rabri Falooda was good too and had chunks of small cut fruits in it. Overall a very wonderful experience and one of the best north Indian meals I had in a while. The Punjabi food festival will be from 13th of April to 1st of May as is definitely an experience not to be missed.